In the development of donor kidney procurement in the Netherlands two improvements can be noticed (Fig. 1). The first is the introduction of reimbursement of the procurement costs in 1974. The second is the appointment of transplant coordinators in the years 1978–1982. Nowadays five transplant coordinators are employed in the Netherlands. 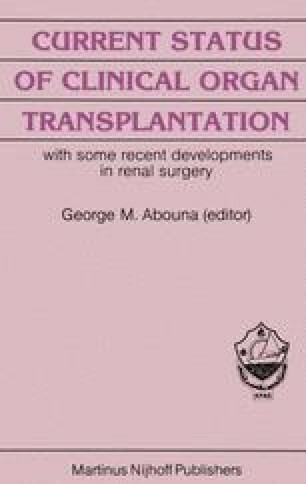 From 1974 to 1982 the yearly number of harvested kidneys was doubled (1). Since 1982, however, the number of harvested kidneys, mostly from heart beating cadaveric donors, has not increased. Presently 22 kidneys are retrieved per million inhabitants per year. The estimated need for the Netherlands is about 32 kidneys per million inhabitants per year (2). One of the possibilities to improve the supply of cadaveric kidneys for transplantation is to harvest kidneys from non- heartbeating donors (NHB).